I have had a ridiculous amount of blackberries in the house as of late. There are just so many growing in the yard that it keeps me fully stocked, and I am totally ok with that. There are so many, in fact, that the day Lauren came over and helped me pick some, I filled a full size greek yogurt tub with them for her and still had an entire tupperware container and plastic berry holder filled all for myself. Needless to say this required some baking because there was no way M and I could shove that many into our morning yogurt before they went bad. As a result, here we have some banana muffins with blackberries in them and topped with some delicious crunchy granola that I whipped up the other day. M said they were the best muffins that I've made yet because the multiple textures made them really different. I don't know about all that (I'm still partial to my rosemary muffins) but they were pretty damn tasty, so please try them out with some berries of your own! 1. Preheat that oven of yours to 400° and grease or line a muffin tin. This should make 12 muffins. 2. Mash your bananas and then stir in the milk. (I always use Silk unsweetened almond milk when I bake because my boyfriend is lactose intolerant, but use what you like best.) Mix in the eggs, oil, and vanilla. 3. In a large bowl, sift together the flour, baking powder, and salt, then stir in the brown sugar. Make a well in the middle and then pour the banana mixture in and stir until just combined. Fold in your blackberries. Measurements don't need to be exact for berries, add more or less to your liking. 4. 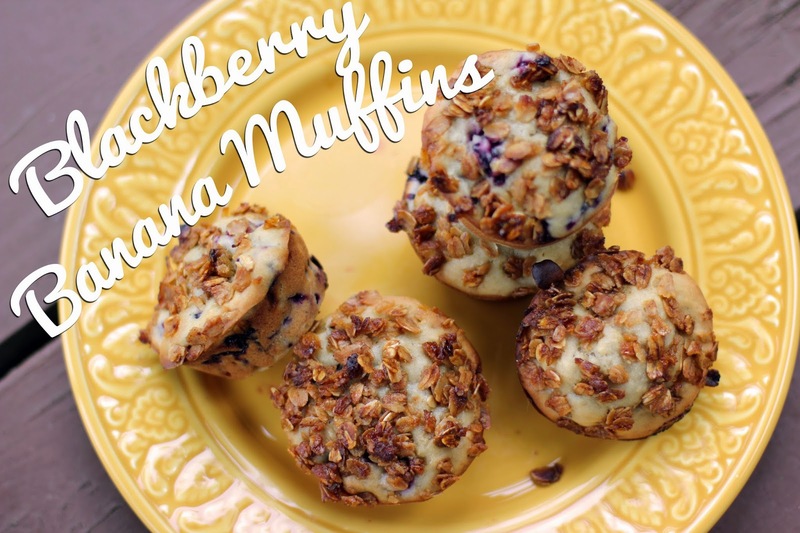 Pour into your muffin tin and bake for 10 minutes, then remove and sprinkle tops with granola. Continue to bake for another 10 minutes, or until cooked through. The type of granola you have will matter during baking, so just keep an eye on it to make sure it doesn't get overly crispy. I sprinkled mine on before I even started baking them at all, and it was fine, but it was also homemade granola, so just play around and be mindful that different granolas will probably cook differently, add it later, or even at the end, if you're worried about burning.